I'm apparently hopeless at entertaining. The last two times I tried...well...let's just say very few/no one showed up. Perhaps someday this will change. But for now, I'm resigning myself to just having things for Michael and I. Which, actually, is fine with me :). Anyway, this week for The Holiday Recipe Exchange we're supposed to post recipes for Holiday Entertaining. Since I can't really speak with experience on this, I'll post things that I imagine I could/would prepare if I were to entertain at the holidays. This pie seemed like something that would be really great for just such a thing. 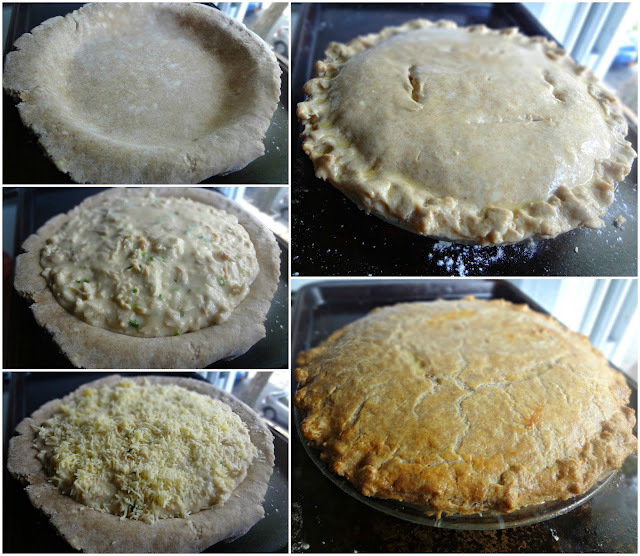 I've made this twice now (first with a Betty Crocker mix for the crust and the second time with my new go-to pie crust recipe, which I will share with you soon). Michael and I both aren't huge fans of the traditional pot pie. Maybe it's too many vegetables. I don't know. 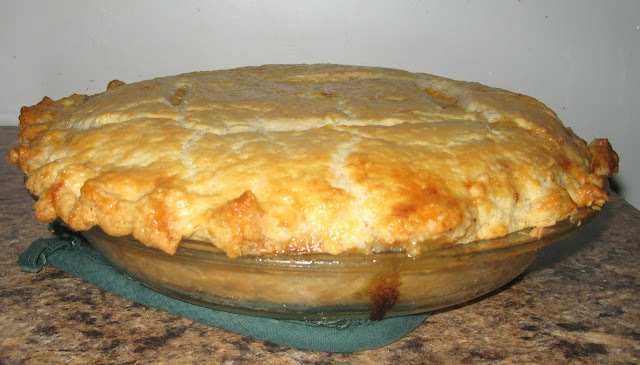 When I stumbled upon this recipe, dubbed "Just Chicken" Pot Pie-I knew maybe this could be something good. And oh boy it is good! The crust tastes buttery and delicious and pairs perfectlt with this insanely delicious, unmistakably chicken tasting, filling. It's hot and filling and is so perfect for these cold months (that, admittedly, the cold has just now started to kick in up here in NY). I know if you served this at a holiday party/function, all the guests would be in love with you (well...unless they're vegetarians)-and that's a promise! If using poultry that's already cooked, preheat oven to 350 degrees and skip ahead past the next step. Preheat the oven to 400 degrees-pat chicken dry and season to taste. Roast 35 minutes. Let cool and then shred it. Reduce oven to 350 degrees. Melt butter in a saucepan on medium heat. Add garlic and cook about 30 seconds. Stir in flour and cook until it begins to brown. Stir in milk and chicken broth and bring to a boil. Reduce heat and simmer until thick (about 5-10 minutes). Stir chicken and scallions into the sauce and season (again, to taste). Let this filling cool until just warm (I usually get impatient and put it in the refrigerator). 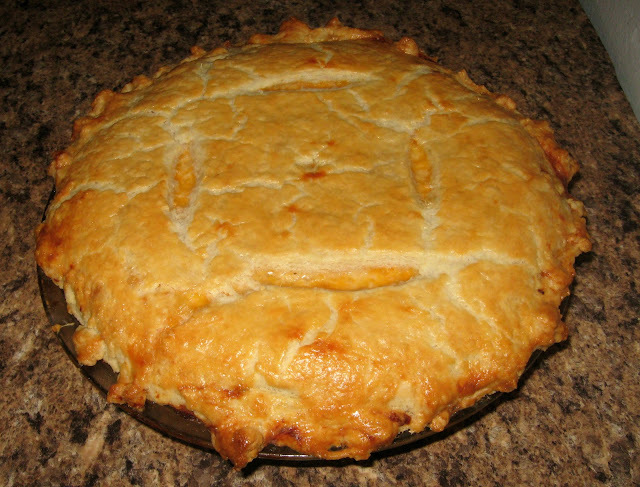 In a 9 inch pie pan (already prepared with crust), spoon filling in and top with cheese. Place second crust over the pie. Cut four 2 inch. slits in the top of the dough, brush the top crust with the beaten egg, and bake until the crust is a GORGEOUS golden brown (50-55 minutes). Cool for 10 minutes then serve! Oh, this sounds and looks like a hit! I've bookmarked it to try! Thanks for sharing!! Also, I love your red and white polka dot apron with the little frills on the bottom! So flippin' cute! Now that I have seen this, it does make me think that I would rather have the veggies prepared to my preference as a side dish than included inside the pie. That slice does look hearty and delicious. Glad you posted this one-yum! I love to entertain, but I am out in the sticks and have a tiny house-so the opportunity is almost an impossibility. Have a great day!